As the first in my family to pursue a college degree, I have found challenges in navigating the privileges and isolation encompassed in the system of higher education. Both of my parents moved to the United States in the late 1980s – my mother from Hong Kong, China and my father from Monterrey, Mexico. Neither of them spoke English or ever anticipated attending college. Yet they knew “University” was something they wanted their children to have access to. As they learned to work through language barriers, they brought me into this life as a “third culture kid,” someone who grows up in a country/culture different from those their parents were born into. With that context, my parents tried to support me in the very little ways they knew how with my schooling. They both grew up in families of 10, both middle children and both from impoverished communities. Therefore, their projections of wanting their children to have a better life – a life they saw as “the American Dream” – made complete sense to me, as being a product of their misfortunes. I had anticipated that going to college was going to be hard. Doing major life shifting things for the first time is always hard. Because I didn’t have any family members to assist me in the college application process, I struggled with filling out the FAFSA (the federal financial aid application) and the Common Application (a one stop shop where students can do one college application to send to multiple colleges). I struggled also with completing the essay portions of all the college applications. I grew exhausted and overwhelmed by the number of applications I had to go through and application waivers I had to collect – so I only applied to four institutions. If I could go back and do it all over again, I would have liked to have had a better understanding of the different kinds of institutions that exist and what each has to offer. In the fall through College Essayist, I mentor high school seniors who are applying to colleges, many of whom are the first in their families to pursue higher education. 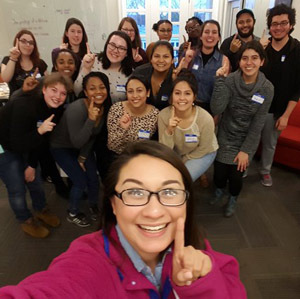 The online-based organization was created by students who were transitioning into college themselves. They identified a gap in knowledge for students who didn’t have college counselors in their high schools or parents who could offer them more supportive and hands-on assistance with their college essays. So this is one of the ways I give back to first-gen bound students who are confused about the college application process as I was once. In my transition to college, I lacked a lot of language, academic prep and financial assistance in finding the “right” ways to communicate in my classrooms, with my peers and with professors. I felt isolated in knowing that a majority of the students felt secure and comfortable in college. They knew their entitlement to a wholesome and meaningful education was “the norm,” and they knew where and who to ask for help if they felt they weren’t being properly supported or served. So in the midst of feeling like I wasn’t enough, feeling like I didn’t belong, and feeling like I had made a mistake for thinking I could navigate this system of higher education, I was also feeling out of place back home with my family, friends and the peers with whom I went to high school. It was one thing to have chosen college as my path, as many of my extended family members did not, or could not afford to. I also had another layer of separation. I had moved from Houston, Texas, to Amherst, Massachusetts, where everything from the weather to the political climate was a cultural shock. Overall, I felt a shift in both of my worlds and felt stuck between feeling that I did not know enough at school and seeming like a know-it-all back home. These disconnects and feelings of exclusion are prime examples of how higher education as a form of social mobility can isolate first generation college students like myself. Straddling being raised low-income then having the ability to raise a middle-class family of my own has left me dumbfounded with the privileges and knowledge I now carry as an “educated” person. With graduation less than two weeks away, I am so happy to say that I did it. I actually “made it.” I went to school. I endured the challenges and obstacles. And now I’m graduating with a bachelor’s degree in liberal arts with a concentration in college access and retention for first generation college students. I dedicated my undergraduate degree to identifying structures and methods of supporting first-gen students, because they are all things I would have benefited from and would have wanted to engage in myself. Looking forward, I hope to pursue a career in student affairs to continue my efforts of identifying and dismantling the barriers first generation college students face in postsecondary education. 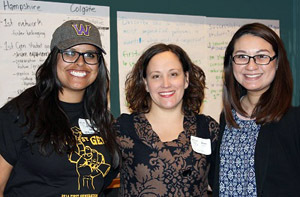 Vivianna played a key role in Class Action’s Fourth Annual 1st Gen Student Summit. Read more about the summit and see photos from the day-long event. Vivianna Lee Alvarez is the cofounder and student coordinator for the FIRST Network and a 2016 graduating senior at Hampshire College. Her work is centered in higher education, access to higher education, and support for first-year students transitioning from high school to postsecondary education. This is a really great essay. Wish something like this was around when I was going through this 1st generation process — unfortunately, I failed at it initially and wind up enlisting in the military. Since you have not gone past college yet, frankly, you underestimate the hurdles that you will be facing if you decide to enter into the real world of power. Suggest that you check out some of the essays, podcasts, and books on my webpage. Thanks for sharing, Valeriano. If you’re ever interested in blogging or posting essays on our site please shoot us an email at info@classism.org.